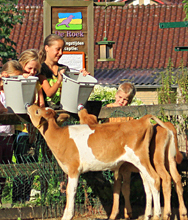 Our petting zoo is certainly a pleasant pastime for young children while staying in or resort. 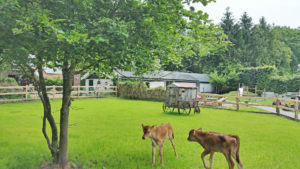 The animals are fed daily at fixed hours and the guests are welcome to assist for instance with the chickens and rabbits, feeding the bottle to calves and lambs, pet guinea pigs or brush the horse. After the feeding it is possible to take a ride on a horse, making rounds on the back of our Tinker ‘Neil’. Besides the petting zoo, De Roek has a playground with an adventure pool that leads right to the sandbox. If the weather is fine it is a real attraction for children where they could play for hours to their heart’s content. In addition, we have bird’s nest swings, a see-saw and a slide. Because cars are not allowed in our resort, it is possible in most cases for children to visit the petting zoo or playground on their own. In our experience, once the children have made friends and they know their way around the park, parents are out of the picture.